Until today, I kept forgetting to take a picture of these signs at the edges of the surface lot adjacent to 2525 McKinnon. Oh, and in the second photo, there is a tree up top the New Rolex Building. Harwood is busy...have they issued an official announcement on this one? That's the site of The Oliver, isn't it? What is the "Seven" in that diagram? maconahey wrote: That's the site of The Oliver, isn't it? clcrash19 wrote: How tall is the lexi supposed to be?? Has there been any rumblings about that project? Is the Lexi still even part of their plans? I don't see it on their site anymore. If memory serves right, that was supposed to be a very tall tower, approx 40 story floors I think. Oh this is the valet lot for St Anne, I wondered when that might get eaten up. That'll be nice, but I'm still holding hope the hotel site closer to Pike Park and Katy Trail will be the special architecture putting the Harwood International exclamation point on skyline. Interesting! 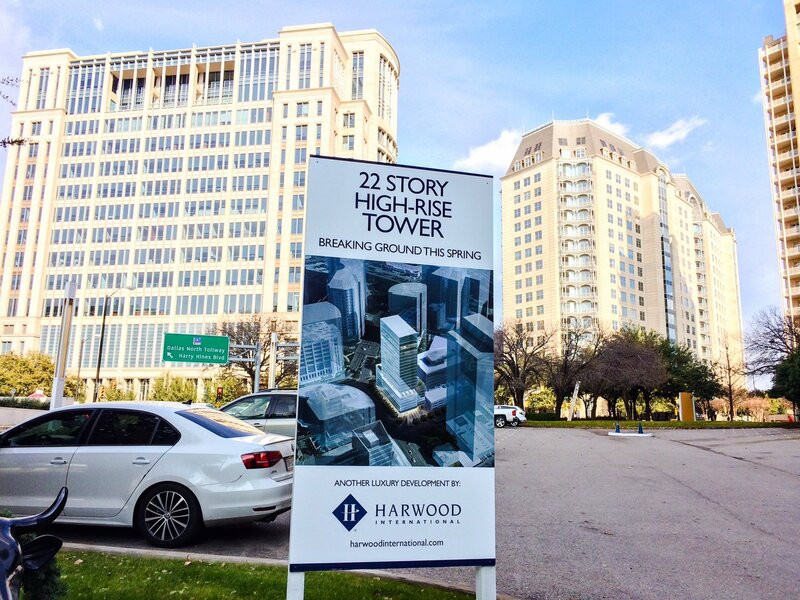 Wasn't Harwood XII scheduled to be an office tower near the AAC? I guess the 2 obvious questions are 1) How tall of a tower are we looking at 2) What Hotel Flag will occupy the tower... Curious to see a rendering. I've generally always liked the Harwood designs. Have there been any announcements about a 22st Hotel in the Harwood District, or does anyone familiar with the master plan see a slot for one? I heard from a reliable source that an announcement was coming soon. Just curious if it's something I missed. I happened to be setting next to a guy at the bar who was up the chain at Harwood. Not sure if the 22 floors still holds true, but that is what I got from him at the time. Well that's certainly a hotel corner then with the Ritz and Crescent Hotels right there. I imagine whatever hotel it is will be high-end business targeted flag of some sort. 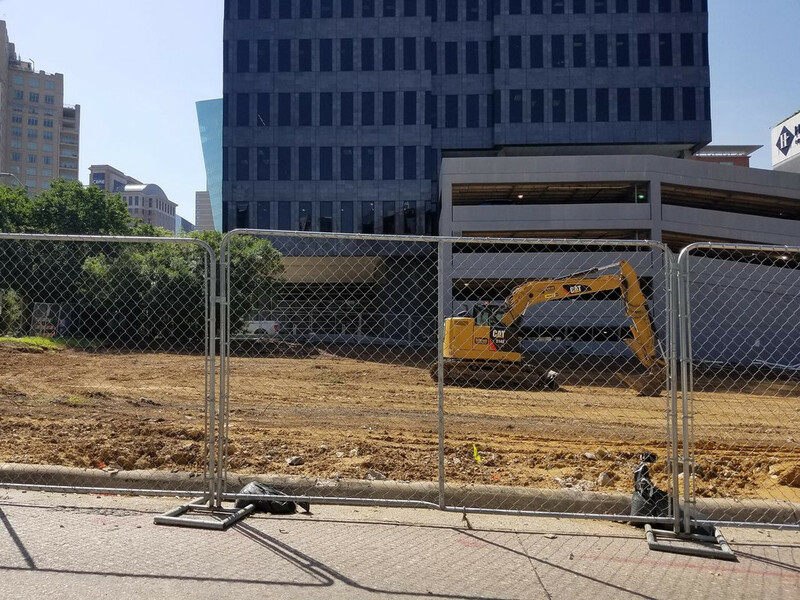 Perhaps with Intercontinental leaving the Addison area, they are looking to open in Central Dallas? A Loews hotel returning to Dallas would be a good fit as well. This is the St Annes parking lot? Looks like it. The site is presently a surface parking lot at the southwest corner of McKinnon and Moody Streets. Its assigned project address is 2012 Moody Street. HDF estimates the tower will be completed by June 2020. The estimated project cost is $50 million, about $5 million more than was estimated for Harwood No. 10. Last edited by DPatel304 on 15 May 2018 11:15, edited 1 time in total. You realize that's the rendering of the office tower already under construction right? Not the design of the hotel that would be at Mckinnon and Moody. cowboyeagle05 wrote: You realize that's the rendering of the office tower already under construction right? 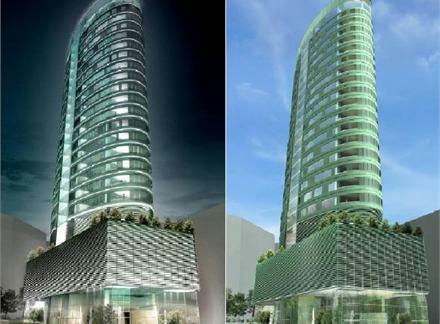 Not the design of the hotel that would be at Mckinnon and Moody. Whoops, sorry about that! I removed the rendering from my post. I recall St Regis stating they were still interested in Dallas after the Turtle Creek site fell through. Maybe it'll be a Sofitel or Swissôtel. . . Fence going up right now. I hope it's something unique to the area. Very little fanfare preceeded No.10 as well. Harwood obviously has sufficient access to capital these days, that promoting its projects is not necessary—perhaps it’s even a negative that alerts competitors to what is planned. The rationale for a hotel seems pretty clear. Harwood is becoming its own submarket, and that submarket does not have a nice hotel. A hotel here can also serve VP, where the old Mandarin site has gone residential, eliminating another potential source of competition. Also if they have the zoning in place already and a flag signed on the dotted line then they don't need to release renderings unless the PR machine decides its something they need to dance out there in front of the public. I am sure execs from many of their tenants have seen or heard exactly whats going in. 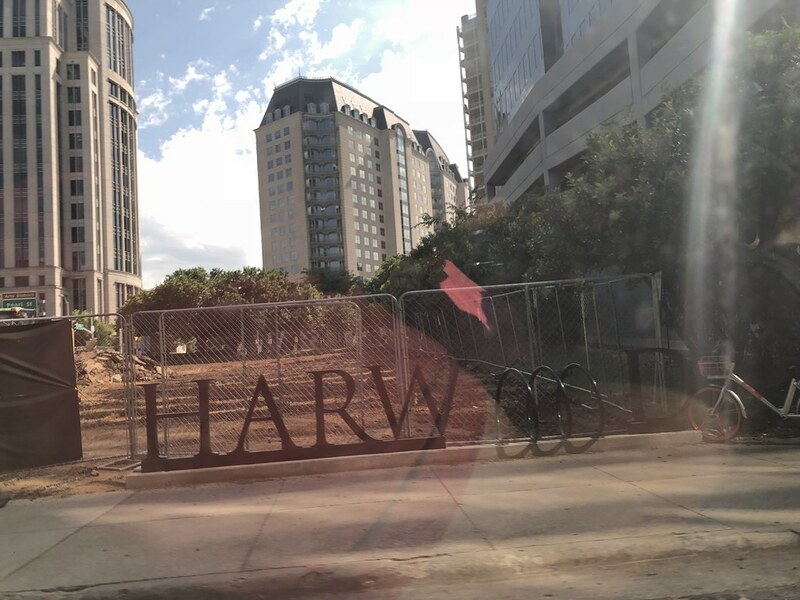 If you are a tenant whose lease is up in the next five years Harwood is taking you to dinner at Saint Ann and telling you about all the wonderful things they have planned and are breaking ground on soon. I imagine Harwood is competing with Legacy in some ways so they have to keep a momentum to keep tenants happier. I also would not be too terribly surprised if the hotel is their own "brand" folded into their existing wing, the Harwood Hospitality Group. They've already dug up the asphalt on this lot. It's moving along quickly. 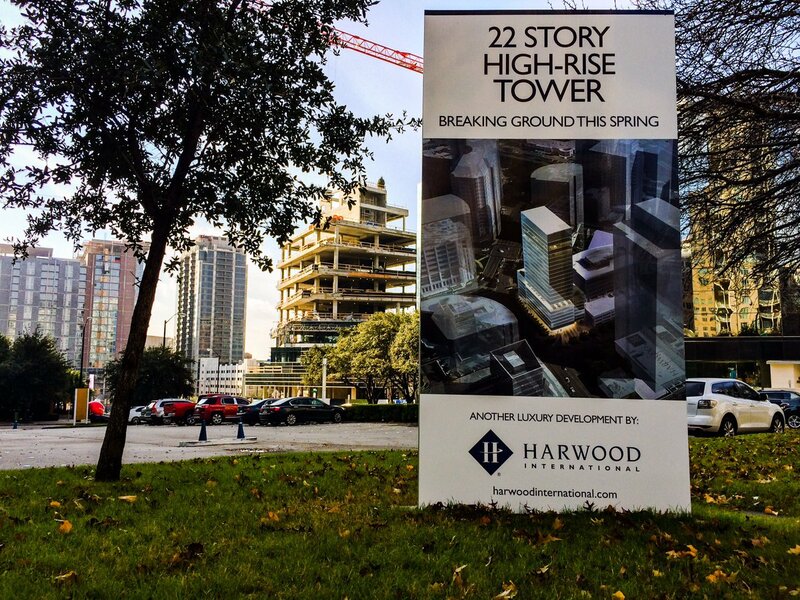 I'm still wondering if it will in fact be 22 stories. More digging going on at this site. R1070 wrote: They've already dug up the asphalt on this lot. It's moving along quickly. I'm still wondering if it will in fact be 22 stories. It's 20 ST by elevator buttons, minus the 13th. Looks like it'll be around 131,904 SF (GSF?) and 135 required parking spaces. They had a good amount of equipment activity today and hauled off quite a bit of dirt as well. Still no visuals to salivate or disgust over. Seems odd that Harwood hasn't put something out there yet. They aren't usually shy about what's going to be coming out of the ground. With a hotel and 6 or 7 restaraunts in the district, it would be nice if everything were connected with some walkable streetscape. Don’t they want people to stay at the hotel because it’s an easy walk to the offices and restaurants? Live Work Play in the same neighborhood means there is a free valet at every building for you to move your car to when it comes to the Harwood District. They have never been very cognisant about doing anything but the bare minimum when it comes to pedestrians moving inside their district. Sidewalks as the city require them but no further. That whole Field, Moody turns into Pearl area is a mess and seems very intimidating to anybody that might want to cross. Rolex seems to have nice sidewalks and I assume the hotel would too but crossing that divide is a mess. Maybe they need a pedestrian bridge right there. 311 emailed me back one day and said they'd do something eventually about the whole cluster-f crosswalk from hell by Rolex. Meanwhile, there is actually basically a crossing-guard at the intersection of doom for the last year or so. A pedestrian bridge at this location is giving-in to cars. No to that. How about just a stoplight instead of autobahn. Yeah everything in the Harwood District was designed to get people onto 35 and Dallas North Tollway as fast as possible during rush hour. Remove some of those corner cuts, square off the intersections and you will make a big impact. That and one-way street removal. CTroyMathis wrote: A pedestrian bridge at this location is giving-in to cars. No to that. How about just a stoplight instead of autobahn. Agreed. This sort of mentality is what lead to the tunnels in the CBD, which ended up hurting street-level activity. cowboyeagle05 wrote: Yeah everything in the Harwood District was designed to get people onto 35 and Dallas North Tollway as fast as possible during rush hour. Remove some of those corner cuts, square off the intersections and you will make a big impact. That and one-way street removal. Unfortunately, I think that's a huge reason why the area has been a huge success. Not because of walkability, but because it has good highway access. I don't think they will change this anytime soon. 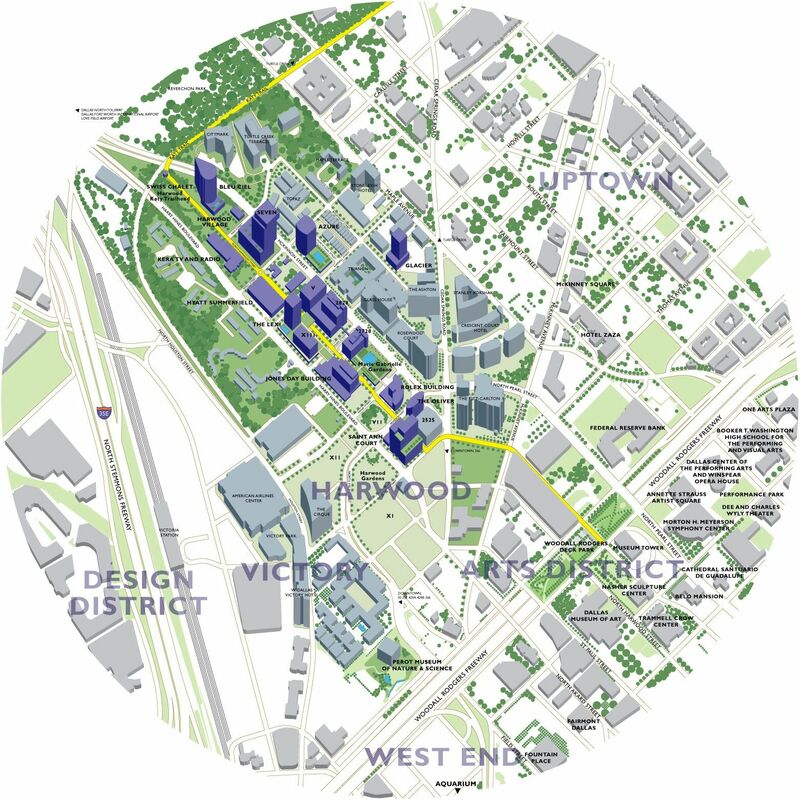 However, there will be a point, in Dallas, where walkability will trump car accessibility, and, when that does happen, I expect the Harwood District to adapt. Right now, Dallas is in this weird point where we want a dense and lively urban core, but we also have to face the reality that the majority of the metroplex still wants to drive everywhere. As a result, we have a semi-pedestrian friendly urban core which is better in some parts than others, but it's clear that the automobile is still #1 in this city. The tides are (slowly) turning on this, and I think we'll see more and more pedestrian friendly development as a result, but it will take years and a lot of dense development to see a much more drastic change. At one time, this mess of an intersection was on the 'outskirts' of downtown, and it make sense to design it the way it is. But, as it stands now, it's as dense, or even more dense than any other area of downtown, and it's time for a serious reworking of these streets. One thing that is a bit of a shame though... There was an opportunity to design Harwood (the street) to be a pedestrian promenade, and essentially surrender the two adjacent roads to cars... but even that isn't really possible now, with so many garage and utility exits oriented toward Harwood. As it stands today, it may be better to convert both Harry Hines and McKinnon to have diagonal parking, narrower lanes, and more traffic lights. For too long, these have simply been treated as part of the DNT itself. 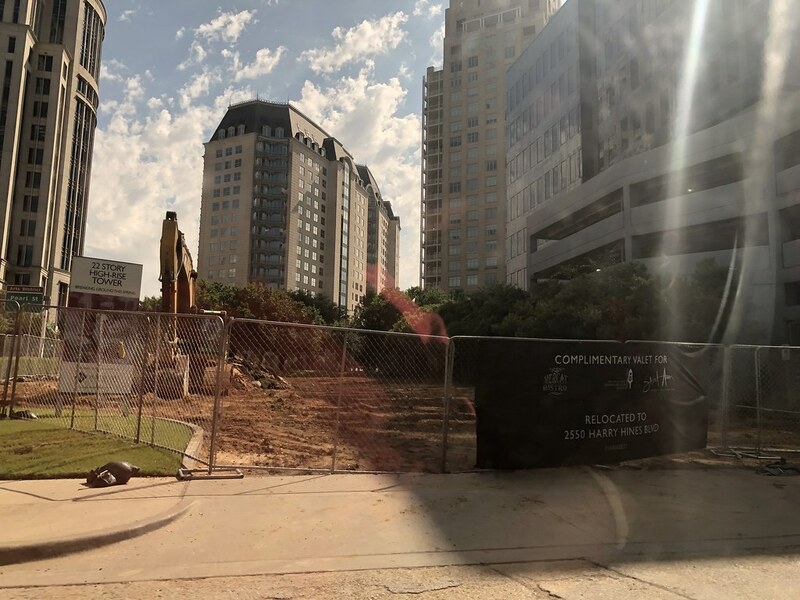 Any rumors on what hotel brand will be at this site? Tnexster wrote: That whole Field, Moody turns into Pearl area is a mess and seems very intimidating to anybody that might want to cross. Rolex seems to have nice sidewalks and I assume the hotel would too but crossing that divide is a mess. Maybe they need a pedestrian bridge right there. A "mess" is an understatement. I've walked and crossed that many times and it's awful. Incredibly confusing for pedestrians. CTroyMathis wrote: 311 emailed me back one day and said they'd do something eventually about the whole cluster-f crosswalk from hell by Rolex. Meanwhile, there is actually basically a crossing-guard at the intersection of doom for the last year or so. That's truly insane. They should not be marking a crosswalk at a location like that until they're ready to install a Pedestrian Hybrid Beacon. They didn't even put in advanced yield markings and a yield to pedestrians sign, which is the Federal Highway Administration's recommended baseline treatment for uncontrolled crosswalks even across low-volume, 2-lane roads once they hit 35mph and *always* for 4-lane roads. Seriously, what are they thinking. This is perhaps the clearest sign I've ever seen that the DOT simply has no idea what they're doing. It can't just be that they're deferential to autos (though certainly that too) because it's not like advanced yield markings and signs affect auto operations, they just make the crossing safer. Be careful with that thought process cause my recommendations do not remove access nor do they change the ease of highway access at rush hour which will always be backed up. My suggestions are more about keeping cars from dominating intersections at high-speed which does nothing for increasing the number of cars through a given intersection. It's about providing a safe environment for the bike, pedestrian, and the car.